A while back I blogged about a Webinar I attended presented by Lauren Freedman of The Etailing Group and Power Reviews in which Power Reviews’ Jay Schaffer provided some tips and examples from retailers on how to ask for customer reviews post-purchase. 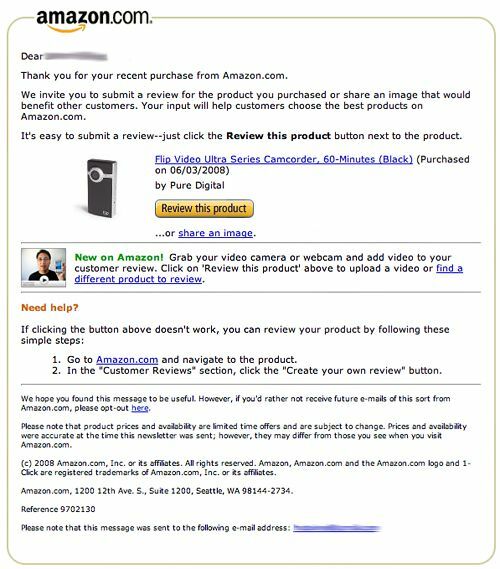 I was recently forwarded this email from Amazon calling for customer reviews – not just textual, but customer photo and video reviews. Thank you for your recent purchase from Amazon.com. We invite you to submit a review for the product you purchased or share an image that would benefit other customers. Your input will help customers choose the best products on Amazon.com. It’s easy to submit a review–just click the Review this product button next to the product. New on Amazon! Grab your video camera or webcam and add video to your customer review. Click on ‘Review this product’ above to upload a video or find a different product to review. Go to Amazon.com and navigate to the product. In the “Customer Reviews” section, click the “Create your own review” button. Thank customer for the purchase. Mention submitting a review benefits fellow customers. Give clear directions how to participate. Give options – text, images or video. Show an image of the product to jog the memory. Offer a plan B if the link malfunctions for whatever reason. Offer an opt-out of future review requests. Remind customers that prices are subject to change, so they don’t feel jilted when the item is $5 cheaper than when they bought it.